This week I have been working on a test crochet project for the lovely and talented designer Susan Lowman aka The Crochet Architect. I first came across Susan via her review of Dora Orhenstein's new book Top Down Crochet Sweaters on Twitter. And then I had to investigate her blog The Crochet Architect and next I found her Ravelry Group. And when I spotted her call for test crocheters I thought I'd give it a whirl. I'm always up for the latest crochet thrill! I am SO rock and roll, honestly! Anyway I love love love the pattern. 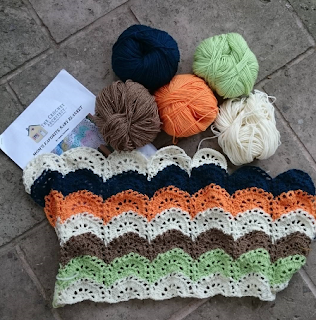 Baby blankets are very popular among my workshop attendees and my charity group make them on an ongoing basis so I'm always on high alert for patterns which might appeal and stretch the growing skills of my hooky peer group. It's an intermediate pattern and I've really had to focus to make sure I'm following it correctly. Continually counting the ch-2 spaces has been crucial. I was working on it in my Yak and Yarn group this week, getting a lot of attention and one of the more forward said "You can make me a copy of that" and I replied sternly "You'll wait until it's published." It's copyright infrigement to make a copy and besides this pattern is my own little secret test project. Have a wonderful week y'all! Whow Whow this pattern is so delicate and beautiful and colours look so lovely together. It looks even better up close mum! I'm glad you like the color combo. Chris at Nimblefingers helped me. And yes, you've guessed who I'm giving it to!! How come mums have an uncanny ability to read your mind?! Your baby blanket is coming out fabulous, Tamara! I'm so glad that you offered to test the pattern for me. You're doing a great job!!! I look forward to getting to know you more and discussing crochet with you in my Ravelry group! Thank you Susan. You are so kind! I'm having such fun with your pattern and I can't wait to see what you have lined up next on your Ravelry group! It disappoints me greatly when I see people disregarding the intellectual property of others. It devalues crochet to disrespect the designers who are the very people who keep the craft interesting and extend the boundaries of it. I'm glad you were stern with that person. Sometimes I think people just don't realize that designers' income depends on their pattern sales or if the pattern is free, on the numbers of people going to their site for advertising revenue. I am quite strict about this and see raising awareness of copyright issues as an essential responsibility of being a teacher. On reflection, I think my friend actually meant to say "you can give me the link" because she is not a native english speaker and I'm fairly certain she will buy the pattern. Yay!